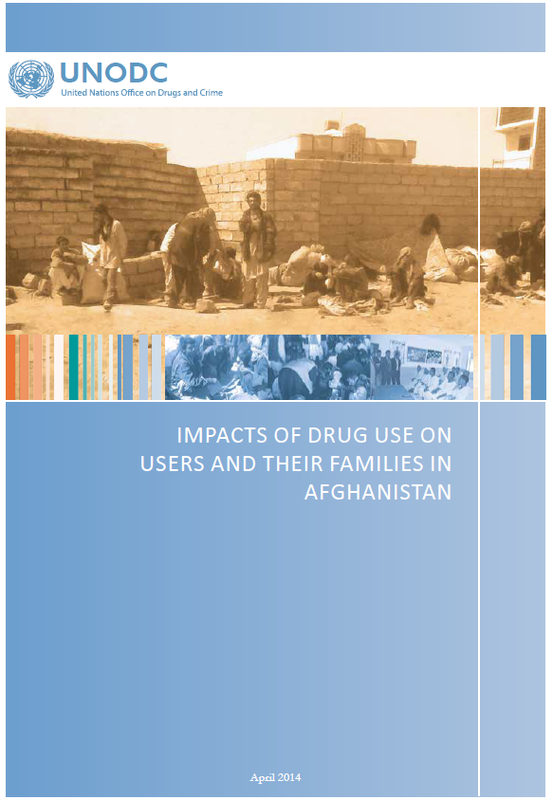 Based on interviews with drug users, the family members of drug users, key informants and Government officials, this study aims to provide an insight into the origins, evolution and impact of drug use on users and their families across Afghanistan. While the study is not nationally representative, it seeks to enhance understanding of drug use in Afghanistan and provide information to help strengthen prevention and treatment policies. 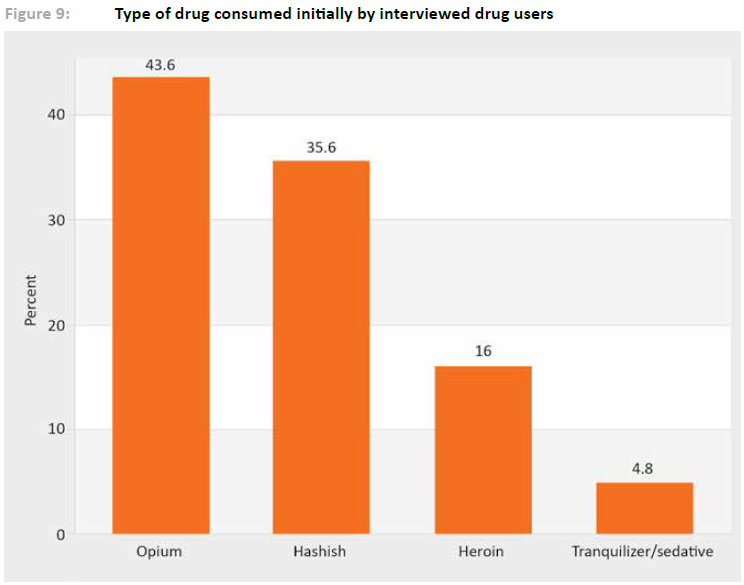 All the drug users interviewed during the study were “problem drug users”, who used drugs such as opium, heroin, hashish and tranquillizers (for non-medical use) daily or several times a week. Although the use of amphetamine-type stimulants (ATS) is rising in Afghanistan, the number of ATS users remains small and that group was not interviewed for the present research study. The study found that drug use led to domestic violence; over half of the family members interviewed said that they had been hit by or had hit out at a drug-using relative during a confrontation regarding the latter’s drug use. The link between drug use, unemployment and poverty is also clear; family members said that 60 per cent of drug-using relatives who had been employed prior to using drugs had subsequently lost their jobs. In addition, almost half of the family members interviewed said that they had been forced to borrow money as a result of drug use in the family and almost 70 per cent said that they had faced financial difficulties as a result of that drug use. The academic progress of children suffers as a result of drug use in the family; over one third of the children interviewed said that they had been forced to leave school as a result of drug use by a family member. Information from key informants also indicated that some children were forced to work because a family member was using drugs. In addition, 15 per cent of the children interviewed claimed that their behaviour had been affected and 7 per cent said that they had fallen ill because of drug use in their family. Drug use is considered a problem in most communities. The majority of key informants believed that drug use was having an adverse effect on their community, with over half claiming to know drug users who had died as a result of their addiction. Over 80 per cent of the Government officials interviewed believed that drug use in their community4 was having a negative impact on the work of their organizations. The creation of a negative atmosphere in the workplace and a greater propensity for corruption were among the consequences listed by those interviewees. In addition, over 20 per cent of interviewed drug users claimed that they had been physically assaulted by law-enforcement officials. 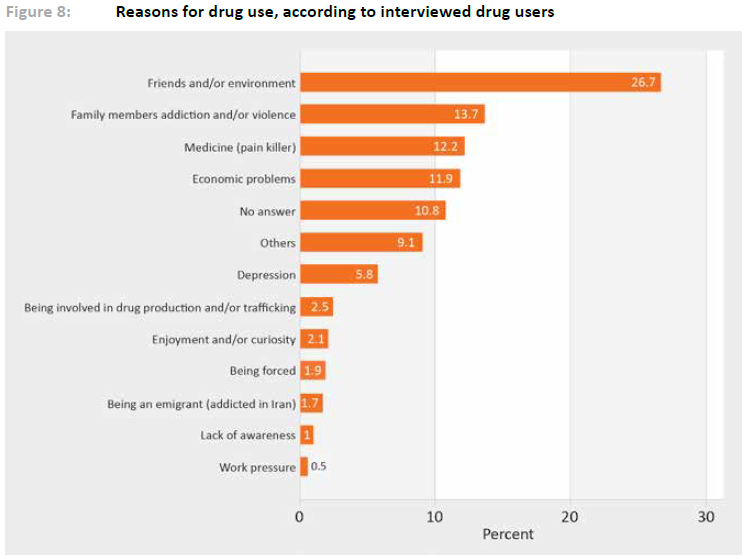 The interviews carried out as part of the research study revealed various reasons behind drug use, ranging from peer pressure, economic issues, depression and medical problems to direct involvement in drug production and trafficking. In addition, a number of interviewees said that they had been coerced into use drugs by another drug user. According to the study, the primary reason for drug use is peer pressure. Female drug users in particular said that they obtained drugs predominantly from their spouses or parents. Male users appeared to obtain drugs from a wider variety of sources, including friends and drug dealers,5 some revealing that they stole in order to fund their habit. In addition, some drug users said that they had become involved in poppy cultivation and the opiate trade as a result of their drug use. Which drugs are consumed, where and how? With regard to the types of drugs consumed, the study found that a significantly higher percentage of women than men used tranquilizers and sedatives for non-medical purposes. Women also exhibited a preference for consuming drugs orally, while men preferred to smoke them. Male and female drug users also exhibited differing tendencies with regard to their preferred locations for drug consumption. 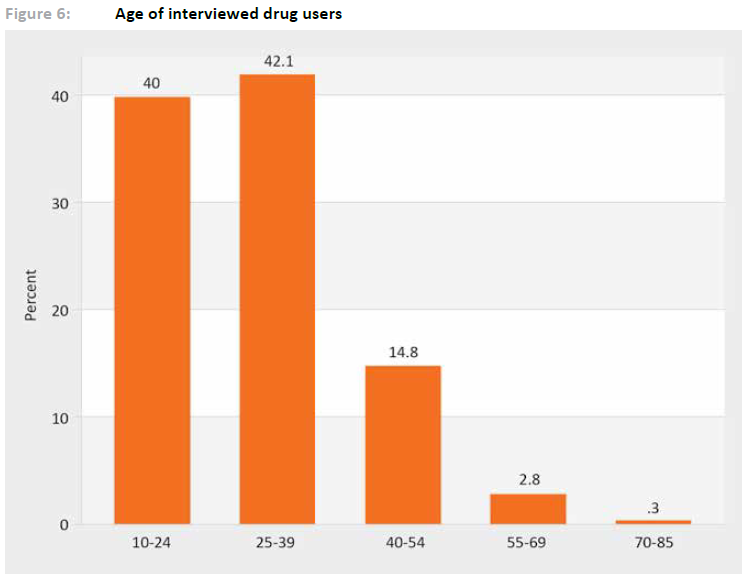 Female users reported that they usually consumed drugs in their own home or their spouse’s home, while male users mentioned a variety of different places, including the workplace and public spaces. It is clear from the study that there is an urgent need to raise awareness of the dangers of drug use in Afghanistan. With peer pressure playing such a major role in introducing people to drug use, it is vital to focus on educating young people. Meanwhile, the prevalence among women for the non-medical use of tranquilizers highlights the necessity of an improved central system for prescriptions. In addition, the increasing number of drug dealers is an issue that needs to be considered carefully by law-enforcement officials. Lastly, it is vital to raise awareness among such officials of the need to treat people for drug addiction.